The International Home + Housewares Show draws thousands of visitors to Chicago, where companies from around the world meet to showcase their best products for cleaning, dining, cooking, and home living. We were on site to seek out the best sustainable products from over 2,000 companies displaying their wares. Innovations were all over, ranging from a DIY greek yogurt maker, to a lunchbox that folds completely flat! Read on to see our list of top products, and be sure to visit our full gallery to see even more products from the show. Expanding on their line of flat-pack water bottles, Vapur has introduced MicroFilter, a filter that safely removes 99.99% of bacteria and organic matter. 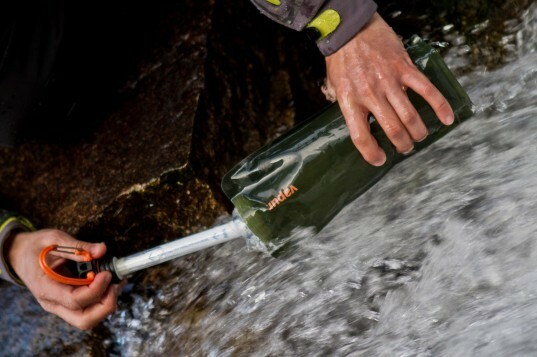 Filtering up to 1,000 liters over its lifespan, the MicroFilter is not only extremely safe and easy to use, it’s also the lightest water bottle filter on the market. The Microfilter is a hollow fiber membrane technology from SureAqua. Vapur’s refillable bottles are foldable, freezable, and washable. 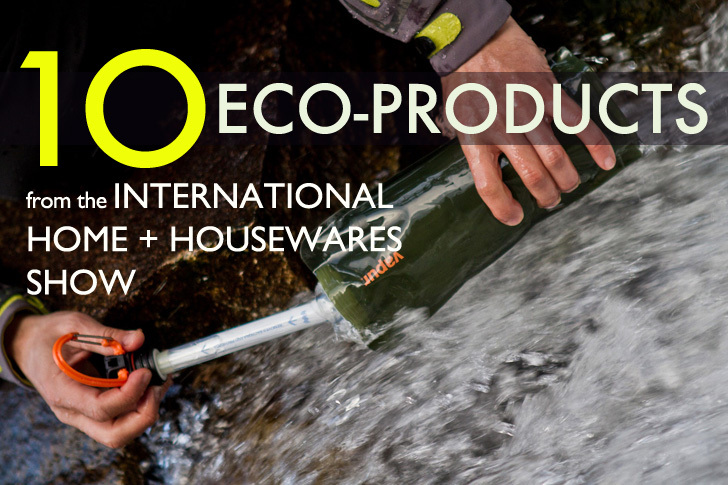 They are a great alternative to traditional disposable water bottles and takes up very little space in a purse or bag. All Vapur Anti-Bottles are 100% BPA free and made in the USA. The makers of SodaStream — the at-home machine that adds bubbles to your tap water — have teamed up with design star Yves Behar for their latest product called Source. It has the sleek look Behar is known for and comes in a range of 5 classic colors. 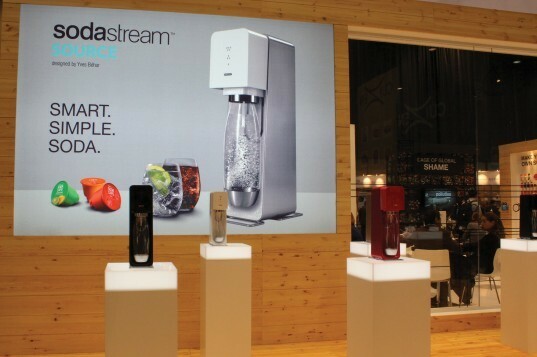 Source differs from earlier SodaStream models in that it has a 3-level LED carbonation indicator to monitor fizz level and a snap-lock bottle mechanism for easy connection. Each BPA-free carbonating bottle may be used up to three years, replacing as many as 2,500 conventional soda packages and reducing a consumer’s carbon footprint every time he or she makes soda at home instead of buying it from the store. SodaStream carbonating bottles are reusable up to three years. Carbonators are also reusable; when empty, they are returned to SodaStream to be cleaned, inspected, refilled, and reused. The SoftBrew porcelain pot from Sowden has a stainless steel filter that brews tasty pots for one. By not using capsules or pods popular in single-cup brewing machines, the SoftBrew reduces the amount of coffee grounds used, saving money for the coffee lover. The pot stays hot longer than glass or steel and works for cold-brew and iced coffee as well. The filter is recyclable. The packaging is made of recyclable corrugate material. Bambooee, the creators of the reusable bamboo towel unveiled their latest products, which include bamboo Swiffer sheets and toilet paper. 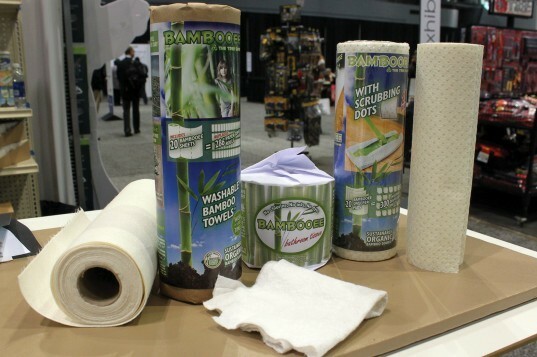 The original Bambooee washable towels, replace paper towels which are estimated to create 3,000 tons of waste every day! We loved the collection from Solvetta, makers of fold flat lunchboxes in bright colors and patterns. 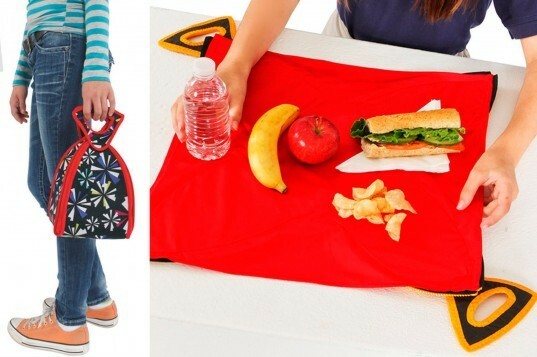 FlatBox-LunchBox folds out to become a germ barrier placemat. The FlatBox-LunchBox is packaged and stored flat, further reducing the distribution cost by 50%. Solvetta is also looking into material alternatives to Neoprene, that are more sustainable and provide better insulation. Makers of architectural glass, commonly used to skyscrapers, have been using the EnduroSheild technology for years in order to save water, chemicals, and labor that goes into cleaning. 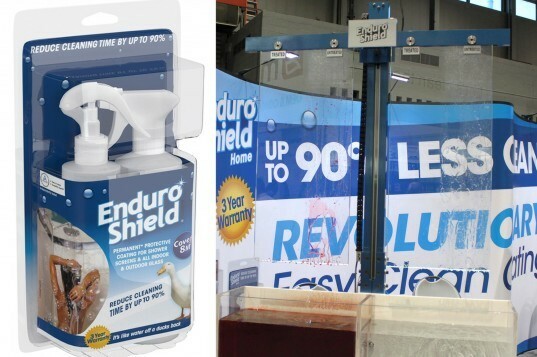 Now EnduroShield is available as a DIY kit for consumers. Applying this non-stick protective coating to glass, tile, ceramic, and stainless steel surfaces will allow the surface to repels grime, dirt, and soap scum. This means that you can extend the time in between cleanings, and use less solutions when you do clean! 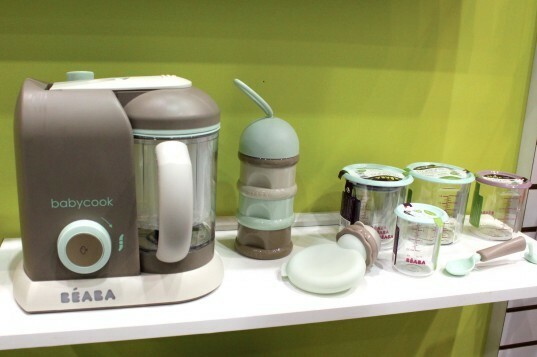 The Babycook Pro is the new and improved baby food maker from Beaba. By easily preparing fruits and veggies, the Babycook Pro offers parents an easy, safe and well designed way to cook healthy and tasty food. This one-of-a-kind, patented compact appliance functions as a steamer, blender, warmer, and defroster to prepare fresh, healthy meals in less than 15 minutes, and the new lid design allows for completely safe one-handed operation. Beaba also offers storage containers and squeeze pouches for eating on the go, allowing parents to save on money and packaging waste of store-bought pureed single serve products. Brazilian company Grupo BB offers products molded from recycled plastic blended with coconut husks discarded from the food industry, waste wood shavings from the furniture industry, and upcycled plastics from the interiors of Tetra Pak packaging. 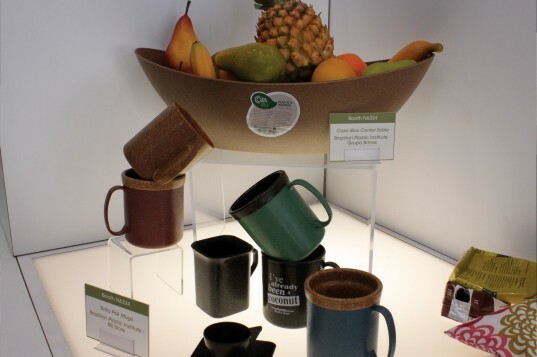 Their line of thermal mugs have a double wall whose internal part is made with of coconut fiber or reforested wood waste fiber. The coconut used for the internal part replaces 50% of plastic used to make earlier mugs, and an external part made from Tetra Pak post-consumer recycled packing. 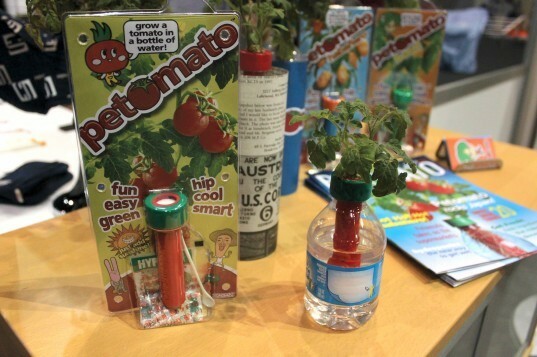 Grow a hydroponic garden in an upcycled plastic bottle with products from Petomato. Petomato is easy and requires little maintenance. Simply insert the seeds into the top of the water bottle, fill it with water and watch the plants grow. 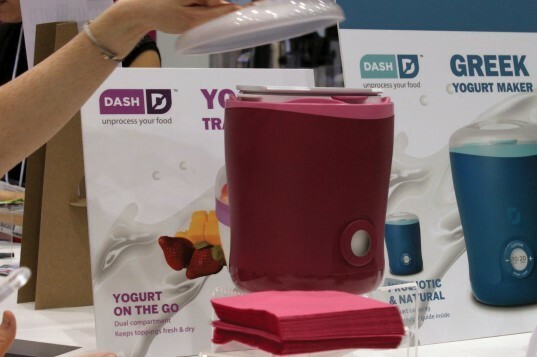 Dash company debuted a prototype of a Greek yogurt maker that they plan to have on the market shortly. Not only does this product have style, but it saves on packaging from purchasing yogurt in plastic containers. You can use cow milk, or choose to use soy or nut milks too! Once milk is added into the machine, it strains and cultures the milk, turning it into authentic Greek yogurt. Dash was sampling their yogurt and it was out of this world, especially since no sugars or preservatives were added. Expanding on their line of flat-pack water bottles, Vapur has introduced MicroFilter, a filter that safely removes 99.99% of bacteria and organic matter. Filtering up to 1,000 liters over its lifespan, the MicroFilter is not only extremely safe and easy to use, it's also the lightest water bottle filter on the market. The Microfilter is a hollow fiber membrane technology from SureAqua. Vapur's refillable bottles are foldable, freezable, and washable. They are a great alternative to traditional disposable water bottles and takes up very little space in a purse or bag. All Vapur Anti-Bottles are 100% BPA free and made in the USA. The SoftBrew porcelain pot from Sowden has a stainless steel filter that brews tasty pots for one. 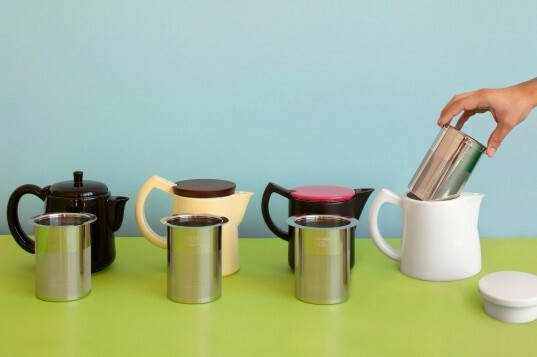 By not using capsules or pods popular in single-cup brewing machines, the SoftBrew reduces the amount of coffee grounds used, saving money for the coffee lover.